*A 6 hour game near Thessaloniki Greece. **Our first game without a lined scenario. 2 bases, different missions given to squads. ***This game is an "intro" for our 12 hour game in April. After the end of the Cold War, America spread out to the rest of the world without any hindrance. But it's greatest opposing force, Russia, started to recover at quick pace, after Vladimir Putin came into power. influence in the surrounding countries, with Russia following the same path. By order of the United Nations, troops are now stationed in two bases, comprised of garrisons by the US and Russia respectively. The general outline to the outside world, is that the two super powers co-exist in harmony and bring peace to the destabilized area. Russia : All Russian camouflage patterns, greek lizard and OD coveralls/clothing. 1)One wrap of white cloth or a bandage for medic usage. 3)Midcap, lowcap or realcap magazines for all AEGs, except machineguns, which can use drums. No high caps! 1 out of 10 players, is a medic and will be identified by a red armband provided by the organizers. 1st hit-> Properly apply and tie the bandage / wrap to the hit player. 2nd hit -> Return to your base respawn point. he returns to his base respawn point. Velocity, energy limits and minimum engagement distance. There is ZERO fps tolerance, as these are the MAXIMUM limits. Any weapon above those limits will be disqualified. The weapons will be measured using 0,2gram bbs by the organizers, with hop up zeroed for flat trajectory. A DMR is what is also considered a marksman rifle in real steel firearms, and may only fire in semi-auto. In other words, putting a scope in a rifle doesn't make it a DMR. only replicas of machine guns, like M249, RPK etc. Route from Plovdiv: https://goo.gl/maps/9qrRXvGfQkN2 (the route via Кърджали has 3 tolls stations 2,40€ each for sedan type cars and 6€ for buses). Софийската група,ще има ли някаква организация ? 1. Think of an option we can use our carbines with speed between 110-130 m/ s. Otherwise we can not participate. 2. Not all in our team have low cap and mid cap magazine. The players are new. Recently they spent a lot of money on equipment and carbines. Think of some compromises on this point. We want to come to your game but have in mind this problems I mention above. If this rules are not under editing, we can make the game with us. I will organize everything if you confirm me your coming to it. Hope to have a game together and have fun. Good luck with the organization of this event. Can you give us +3m/s tolerance, which means 430FPS? 1. The limit for AEGs is 420fps = 128mps. Are your AEGs really tuned to the edge of your games max levels (130mps)? I guess not, for you not to be disqualified at your own games, right? I'm sure your AEGs are not 130mps, but a few mps lower. So with any AEG that is 128mps and lower, you can participate just fine. 2. The rule of mid/low caps is very strict here Can't do nothing about it. For over 3 years all our games (even the small everyday games) are played with midcaps, sorry. Thanks for the cheer up! Looking forward to participate at your game. We loved the games we had in Bulgaria. On topic 1: I’m using SYSTEMA Super Max with different types of cilinders so I guarantee that my rifle will be in the limits. Most of the players in our team are also in the limits (128m/s) but there‘s a chance that one or two rifles maybe will pass the limit of 128m/s because here we use 130m/s as rule. On topic 2: I understand you. We will do our best to equip everybody with midcaps for the game. About the fps: the general rule for fps at our community is 400fps for AEGs at woodland. The 420fps limit came from tolerance of +/-5% because of different chronographs. So there is already a tolerance for this limit. I'll talk to our board representatives, but I can't assure you yet, that AEGs above 420fps will be allowed. We have a meeting this Sunday, so Monday I'll have news for this issue. Thank you for all you have done. We will try to be in the norm. But it will be difficult to convince someone to reorder his whole carbine for 6hours game. As far as I know, the concept was to play a friendly game. I am fan of safety first concept and I am sure no one from Bulgaria will have the mind to harm. I am sure we will make it work for the game and confirm the friendly communication between us. Please, send me the script of the game; concrete coordinates of the game's map; if there is a photos of the terrene, it will be good to have them; also want to ask you how many people will play in this game; Please, send me invitation and rules to enter with airsoft replicas in your country. Thank you in advance. IMPORTANT: For invitations we will need the name of every club/team, that will participate in this game (e.g. "Хиените", "Орловци", "Bad Company" etc.) in English. The invitations will be uploaded here, so you could download and print them. The terrain can be seen in game description (http://i67.tinypic.com/2hwhe8k.jpg HD image where a light blue shadow shows the borders, https://goo.gl/maps/GVuK6aRWyPr the Google Maps link). In a few days i will let you know how many people will come from Hyenas. Bad news, guys.. Our board did not passed the tolerance of 10fps, even if a player would use only semi. As I've mentioned before, our real limit is 400fps and the 420fps is the maximum, because of +/-5% of different chronographs. Sorry again, but there is nothing I can do about it, so as written in the initial post, any weapon above those limits will be disqualified. For what do we need an invitation ? To pass the replicas through the Border control or something else? About 5 years ago, I have participated in the Black Hawk Down airsoft event again near Thessaloniki, we didn't have any invitations and we didn't have any problems at all at the border control. If obligatory, how can I get an invitation, when I am not a part of a team? Invitations are needed for border police, only to show them where are you going and what are the AEGs, that you have. Normally there will be no baggage check at the borders, but if there will be, the police would want to know what are those things, looking like AKs and M4s, you have with you. The invitation will show where are you going and what's the point of it. Also I will upload a Gun Law here for you to print. In Greece the AEGs are considered as air weapons and there is no need to have a license for them. You must be at least 18 y.o. and to carry them in cases/bags, with AEG, batteries and magazines in separate spots. I don't need to tell you that it's strictly prohibited to show the guns a public places. Still IMPORTANT: For invitations we will need the name of every club/team, that will participate in this game (e.g. "Хиените", "Орловци", "Bad Company" etc.) in English. For individual players, we will need a name, surname and the town you leave (you can send these in p.m. to me). The "deadline" for this info is Sunday 6/3/2016 (one week before the event). The invitations will be uploaded here (for individual players will be sent by p.m.), so you could download and print them. *As I will be a leader for the Russian side, it would be better if all Bulgarian players would participate with Russians (complying to the demanded dresscode) for a smoother gameplay. The missions will be similar for both sides. 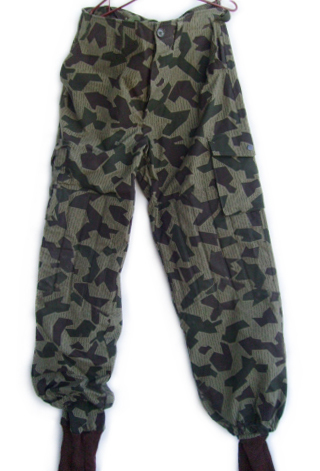 Can we use bulgarian splinter camo as RUssian uniform? Hi again! Thanks for this info. I'm sorry to ask again but what about Vegetato and A-tacs? Which side are they for? Just to be sure what we can bring because our team just spent lots of money on new camouflage pattern. Just be ok with the headgear as demanded in initial post and we'll work it out for you to be on Russian side. Because of Northern Greece Motocross Championship at this gamefield, we'll have to move the date of the game two weeks after the initial date (new date is 13/3/2016). We found out about it just yesterday. Pls check again the new date. We really hope you all can make it to the new date.